I’m starting to think that when the marketing folks at TNT say “We Know Drama,” what they really mean is “We Have Analyzed The Fundamental Principals Governing The Hourlong Television Shows Of The Past Three Decades And We Have Learned How To Synthesize Them.” Dark Blue is the latest TNT series to follow The Closer formula: having a familiar face play a reasonably complex, basically sympathetic character in a well-worn genre. 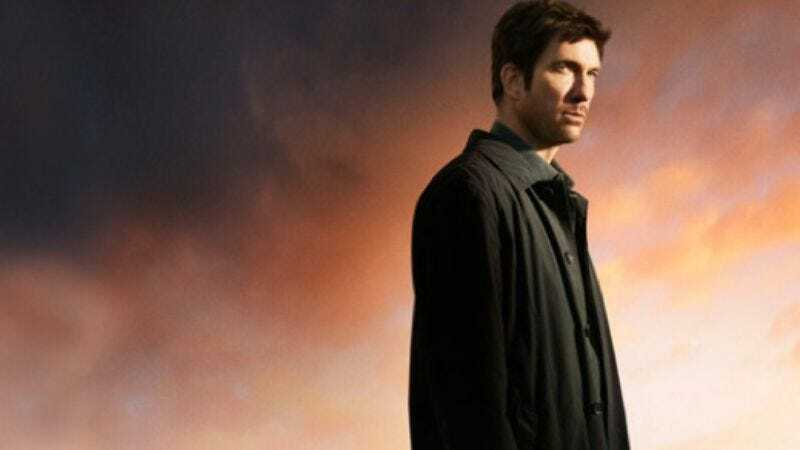 In this case, the face belongs to Dylan McDermott, and the genre is “gritty undercover cop story.” McDermott plays Carter Shaw, the headman of what amounts to a Black Ops Division of the Los Angeles police force. His bosses don’t want to know the specifics of what Shaw’s up to; so long as he’s staying within the bounds of the law and making huge collars, he’s allowed to toss out the LAPD employee handbook. Take a pinch of Baretta, a dash of The Shield and a soupçon of The Practice and voila: Dark Blue. I’ve seen two episodes of Dark Blue so far—the pilot that aired tonight, and next week’s episode “Guns, Strippers And Wives”—and thus far the show strikes me as solid, with a few intriguing elements that could mature into something special down the road. But there’s also more than a little bit of “TNT-ness” about Dark Blue. It’s slick and self-serious, and flashes only a surface edginess. Tough talk abounds, but there’s not much about the show that’s as challenging as its influences. Dark Blue’s main selling point is its depiction of the specifics of undercover work. In the pilot episode, one of Shaw’s most trusted men—Ty Curtis, played by Omari Hardwick—gives a speech to new colleague Jaimie Allen (Nicki Aycox) about how the longer one pretends to be a thief, a killer or a drug addict, the harder it is to let that cover go once the assignment’s complete. There’s nothing new here; those kinds of speeches and that particular theme have been a staple of undercover cop stories from the pulps to the big screen to the tube. What’s interesting about Dark Blue is how it examines the complicated logistics of the job. When does a cover lose its effectiveness? How much illegal behavior are you allowed to witness before you make your bust? How do you get a message out to your commanders? And how do you supply the money/drugs/guns/etc. for your stings? Some of those kinds of issues have been handled in undercover cop stories before—most notably in the Infernal Affairs films—but there’s a matter-of-factness to the way Dark Blue handles them that I found appealing, especially in the midst of a lot of the show's clichéd “brooding, soulsick lawman” business. In the pilot, Shaw’s deeply concerned about one of his operatives, Dean Bendis (Logan Marshall-Green), who’s so into his role as an undercover mobster that Shaw’s half-convinced that Bendis has turned. In one tense scene, Shaw and Curtis corner Bendis while the latter’s in the midst of running the mob boss’s SUV through an automated car wash, and the beat-the-clock aspect of the car wash itself both brings energy to the exchange and leaves everyone involved wondering whether Bendis is just saying what Shaw wants to hear so that he’ll get the hell out of the car. In the end, Bendis helps bring the bad guys down, though in the closing montage, we see him stashing a wad of bills in a secret compartment in his home. Next week, that wad of bills comes into play, once again raising the question of whether Bendis is just making use of the resources at hand in order to do his job, or if he’s become an actual criminal. That’s an intriguing question. Unfortunately, it’s also one raised so expertly on The Shield—also set in Los Angeles—that Dark Blue can’t help but feel a little second-hand. And at the moment, there’s no character on the show—not even the slippery Bendis—who’s as charismatic as Michael Chiklis’ Vic Mackey. That’s what I mean when I mention Dark Blue's “TNT-ness.” I don’t get the sense that the show’s creative team—which includes Big Love writer Doug Jung and a bunch of CSI vets—means to toy with our loyalties or ask us to struggle with our own moral codes. And yet they’re not making Burn Notice either—or even The Closer. In both episodes I’ve seen, the heroes and villains do a lot of posturing and sniffing around each other, trying to figure out who’s legit. By the end of episode two, it starts to get a little repetitive, especially since no one seems to be enjoying him- or herself. It would help greatly if McDermott brought to Shaw a little of what he brought to Bobby Donnell on The Practice. Here he has none of that underdog, live-wire energy; he’s all mumbly and scruffy, and doesn’t make much of an effort to inspire his team or make a case for their existence. He does recruit Allen with a pep talk about how “I see everything that needs to be fixed,” but that speech is more about him, not his cause. We find out from special guest star Kyle Secor (playing an FBI agent) that Shaw lost his wife, which helps fuel his drive to exact justice on the lawless. But that drive only seems to extend to him slouching in the corner of the screen delivering lines like, “L.A.’s a big place with lots of bad people, and contrary to popular belief, I don’t know ‘em all,” and, “There’s going under and then there’s stepping over. I get scared when I don’t know the difference.” Shaw doesn’t do much in the way of actual policework in the first two episodes. In fact, if this were any other network than TNT, I almost might expect that there's something odd and unexpected going on. In the first two episodes, Shaw hangs around the periphery of the action, monitoring his charges and occasionally scolding him. He’s like an unshaven, annoyingly opinionated ghost. Now that would be a twist-one worthy of a more adventurous network. -Yes, I'm aware that TNT's Saving Grace has a deeply bruised heroine who talks to an angel. That show is an outlier, though in a way even its edginess has always struck me as relatively shallow. It's shocking at first, but not really all that provocative. Holly Hunter carries a lot of Saving Grace's punch. -The “Dark Blue” title reveal looks like the opening credits sequence to a superhero movie. There’s the influence of exec producer Jerry Bruckheimer. -Why did special guest star Kyle Secor look like he was wearing lipstick? Did the DP and makeup person not account for HD?